Question: How do you cut large videos and use the certain parts you want? I record a few videos and want to share them on YouTube. But first I need to cut the videos so that I only upload the important parts in order to save time. How can I do that? We may have encountered the above situation too. You have shot a good video but it contains some unwanted clips and unnecessary content, which makes it very large to share on YouTube or play on your iPhone and Android phone. To make thing simple, you can cut the video into several smaller parts and remove the unwanted clips based on the needs. Well, we can use Wondershare Filmora9 - which helps you cut videos into several parts and provides lots of video editing functions to make a great home movie. Free download Filmora9 video cutter software and then follow the step-to-step guide on how to cut video below on Windows7/Windows 8/Windows10. If you are a Mac user, turn to Filmora9 for Mac Video Editor for help, which has the same functions as the windows version. Why choose Filmora9 ? Form the above video tutorial we can see, using Filmora9 video cutter to cut videos without quality loss has the following advantages. Easily cut videos into different parts with no quality loss. "Scene Detection" function automatically split cut videos into pieces. Supported OS: Windows (Windows 7/8/10 included) & Mac OS X (above 10.10). 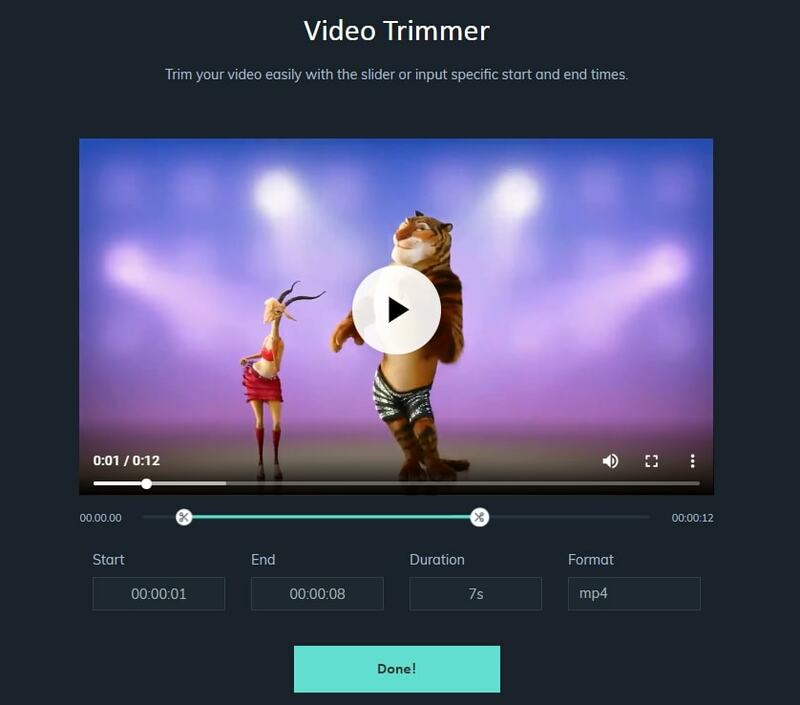 If you want to have an online solution, Filmora online video trimmer is a free online tool that can help you trim video instantly. You can upload your video from computer and video link with drag-and-drop. It is easy to use with the slider or just input specific start and end times for precise trim. It also supports various importing and exporting video format, including .mp4, .mov, .wemb, .mpeg, .flv. More importantly, the exported video is free of watermark. It is definitely worth a try! After installing the video cutter, launch it and select Create New Project to enter the video editing interface. Now, you need to import the video that need to cut to several parts. You can either click "Import" on the main interface and select files from your computer, or just simply drag and drop files to the media library before adding them to the Timeline for editing. This video cutter supports almost all regular video formats, such as MP4, FLV, AVI, VOB, 3GP, 3G2, MOV, F4V, M4V, MPG, MPEG, TS, TRP, M2TS, MTS, TP, DAT, WMV, MKV, ASF, DV, MOD, NSV, TOD, EVO, etc. Drag videos from the media library to the video track on the Timeline and following these instructions to cut video files. To cut out the beginning part or the ending part of a video, you can use trim feature to cut it out quickly. Zoom in the timeline to locate the frames that you want to cut out. And drag the trim icon to the right to remove the beginner part of the video on the timeline, or drag the trim icon to the left at the ending part of the video to cut the unwanted ending parts. With the trim feature, you can cut the beginning part and closing part with one drag. If you want to cut the parts of a video, follow the steps below: Firstly, move the playhead to the beginning position of the video part that you want to cut, and click the Split icon (scissor icon) on the toolbar to split the video to get the starting frame, and then move the Playhead to the ending frame of the video and click the Split icon again to get the ending part of the cut video. Repeat the process to cut a video into multiple pieces. Now, you will get several cut parts, you can delete the unwanted parts, or re-order the cut videos and edit it further. To delete an unwanted cut video, you can cut it out by clicking Delete icon on the toolbar. 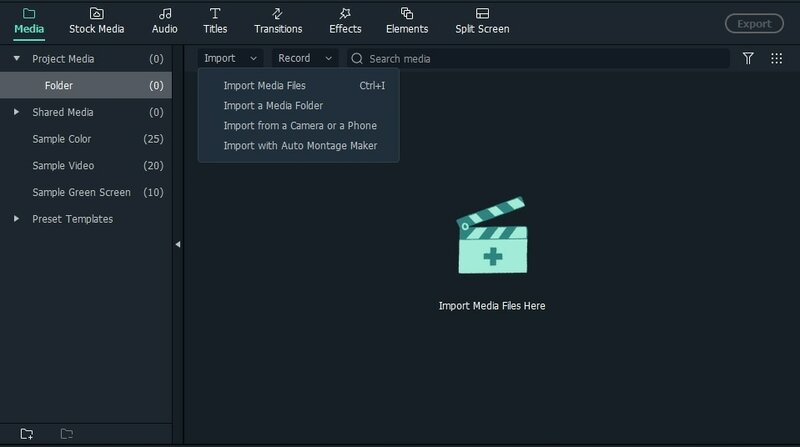 Currently, Filmora9 can not save the cut parts into different video files simultaneously, so you have to save multiple sections for different files one by one after deleting unwanted parts. To improve video editing efficiency, Filmora9 also provides a quick trick to trim videos. Locate the beginning part of the clip that you want to keep in the timeline, right click the video and then select Trim Start to Playhead to get the starting point of the video; locate the ending point of the clip that you want to keep, and place the playhead to the point, right click the clip and select Trim End to Playhead. To quickly find the segment you want to cut, the "Scene Detection" function will help you a lot. Highlight the video in the media library (not the timeline), right click it and select "Scene Detection" to enter the Scene Detection window. Click Detect and Filmora9 will separate your videos into different parts automatically based on the scene changes. You can delete the unwanted scenes by click the Delete icon next to the clip and then get your wanted part easily. Click the Add to Timeline button and all the separated video parts will be imported to the timeline directly, you can then edit it further. For the step by step tutorial about how to use the Scene Detection feature to split and cut videos, check our tutorial about Split Your Video into Sub Clips with Auto Scene Detection. When you have finished the cutting, click Export. 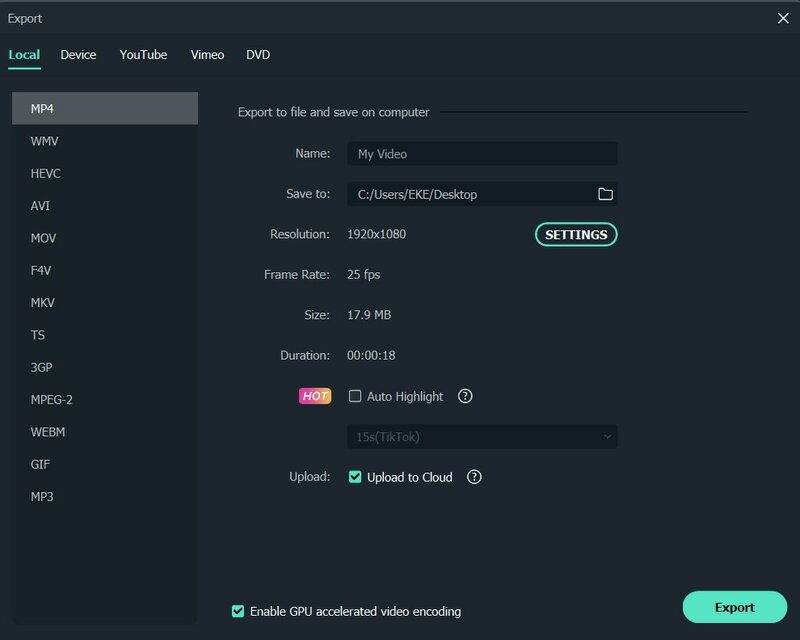 You can save video in other formats on the local computer by clicking "Format" and specify some necessary settings such as frame rate and resolution. If you want to play video creation on iPod, iPhone, iPad, click "Device" and select the thumbnail of your devices. You can also share your videos on YouTube directly or burn video to DVD discs for better video preservation. Apart from the methods mentioned above to cut videos, you can also use the Instant Cutter Tool in Filmora9 which allows you to cut large 4K videos and action camera videos without re-encoding and quality loss. To use the Instant Cutter tool to trim and merge videos quickly, you need click the Import button first and then select Import with Instant Cutter Tool option. And then drag and drop your videos into the timeline to start trimming. You can use the trimming sliders, the set in/out points, or set up the starting and ending time to trim and cut videos quickly. In case that you want to cut out several clips from the same video and save it separately, you can use the Add Segment feature to generate new video clip. For the specific steps of using instant cutter tool, check our Instant Cutter guide.